Club #655 which meets Saturdays from 1:00 pm until 3:00 pm in the Mount Lebanon Public Library, 16 Castle Shannon Boulevard. 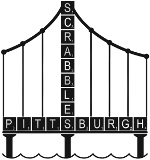 Contact Bob Hagerty at 412-417-5415 or visit pittsburghscrabble.com. Club #620 in Charleston, WV which meets on the second and fourth Saturday of each month from 1:00 pm to 4:00pm at Books-a-Million on Corridor G, and on the first Wednesday of each month from 6:00 pm to 9:00 pm at Los Agaves, 508 3rd Ave. Contact Brad Mills at 304-345-0484 or . Scrabble® is a registered trademark owned by Hasbro in the United States and Canada, JW Spear and Sons (a division of Mattel) in the rest of the world. This site was designed by Brad Mills, Director of NASPA Club #620.